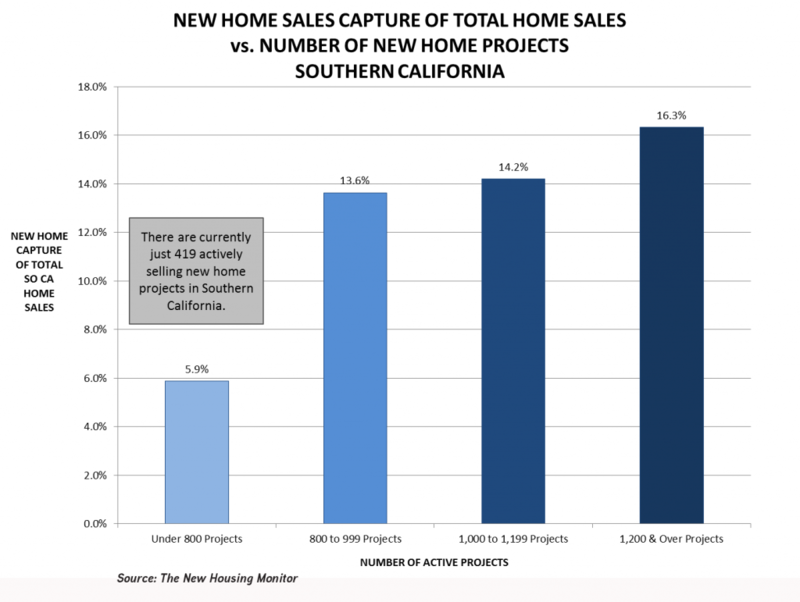 Good luck finding a new home to buy in Southern California these days-the supply of new home projects open and selling in Southern California is currently at a 20-year low. 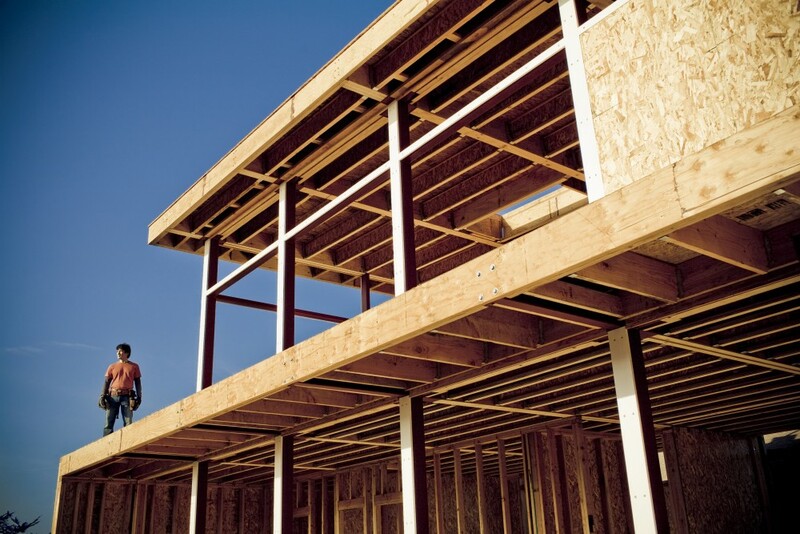 Cautious capital, a lack of finished lots, and notoriously slow planning departments are all contributing to a serious deficit of new for-sale housing in the region. 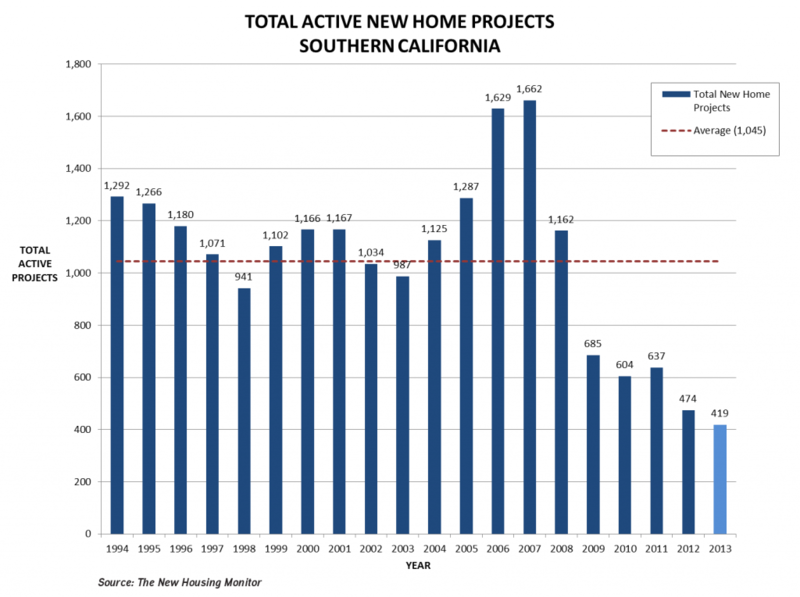 There are currently just 419 actively selling new home projects in Southern California. In comparison, the market has averaged 1,045 actively selling projects annually over the last 20 years. In peak years, there have been over 1,600 actively selling projects. The current supply is 60% below the long-term average and 75% below peak years. The number of active projects in Southern California would need to be 2.5 times higher than today just to return to the average of the last 20 years. The lack of new home supply is holding down total sales activity and contributing to rising prices. Historically, when the supply of new housing has increased, new housing’s capture of total sales has increased as well. Over the last 20 years, new home sales have represented an average of 13% of total home sales in the region. However, when supply is highest, the new home capture rate rises to over 16%. Conversely, when supply is lowest, sales capture plummets, averaging only about 6%. If there were more new home supply on the market today, new home sales would be much higher. It is worth noting that resale activity in Southern California will likely total about 239,000 units this year, which is only about 4% below the annual average of the last 20 years. New home sales on the other hand are on pace to total only about 15,000 sales this year, which is 58% below the average of the last 20 years. If resales this year in Southern California are off the long-term average by only 4%, why are new home sales down 58%? The answer is clear: lack of supply! 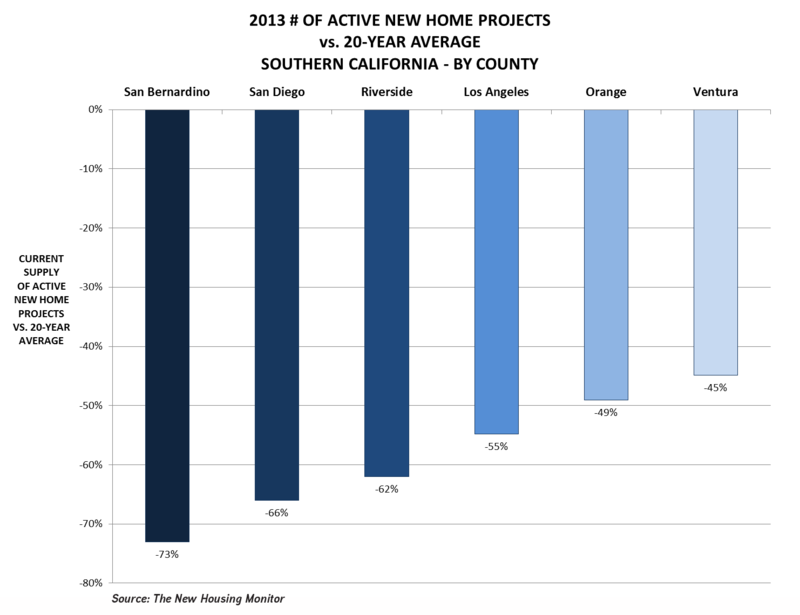 The biggest declines in the number of active projects have been in San Bernardino, San Diego, and Riverside Counties. So while we recommend that any comprehensive market feasibility study for new residential development should include a review of both market supply and demand conditions, the potential for an over-supply of housing in most Southern California markets is not a major source of concern at this time.